Please click here for specific details of results we listed below. As of Thursday (February 28th), The MP63 Fund (DRIPX) turned 20 years old. It seems like yesterday when we decided to offer a mutual fund as a way for Moneypaper subscribers to invest in a DRIP-like manner for their IRAs. Five years earlier, Executive Editor David Fish and I had put together an Index of DRIP stocks. An analysis of the performance of that Index, compared with the established Indexes, made us believe that we were onto something. In 1999, the 63 DRIP stocks that made up the Index became the components of the MP 63 Fund. David Fish and I, with the help of Mario Medina, managed the Fund until 2017 and Mario and I until now. Sadly, David passed in May 2018. Of course, we miss him and wish that he were with us to celebrate this milestone. Many of our shareholders have been along since the Fund’s inception in 1999. 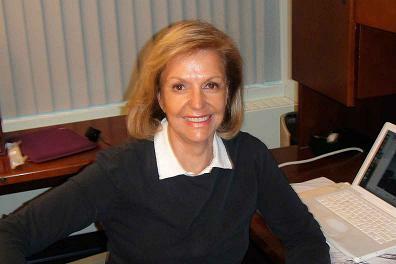 I’m writing to you now to share information about the results we have achieved over the 20 years, which are in part a result of your behavior—that is, your resisting the urge to respond by selling during sharp market declines and by your investing regularly to add to your holdings over the years at a variety of price points. Thanks to the restraint and patience of our long-term investors, we have not been forced to sell into market downturns and we have been able to support the companies in our portfolio during both good times and bad. Thank you for your abiding confidence in us, Mario and I hope and expect to continue to earn it. 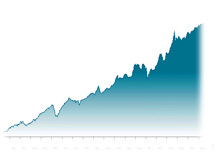 • Outpacing the S&P 500® Index since our inception. • And doing that with less risk and volatility as seen by our lower than market Beta. • Earning an overall 4-star Morningstar ranking for the past three years, five years, and 10 years. • Running the fund with a lower expense ratio than its peer group. • Maintaining a low annual portfolio turnover. • Providing more down market protection during down periods than the S&P 500. • Providing our investors with an increasing dividend over the past 20 years. Growing from 6 cents in 1999 to 41 cents in 2018. • And finally, DRIPX received the Gold Medal from Morningstar, which means that Morningstar analysts believe that the fund has the ingredients to outperform its peers in the future. In today’s uncertain and volatile environment, we think the fund will continue to be a solid investment. Past performance is not guarantee of future results. If you value your experience with the fund, please feel free to forward this note to those who might benefit by considering DRIPX for their core holdings. Please click here for specific details of results we listed above. As you begin your journey into investing directly through DRIPs, you'll want to refer to this site for the latest information about the operations of the plans as well as for assistance to help you get started. We are constantly updating the site with new information, so you may want to make it one of your "favorites." 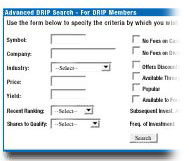 Search for DRIPs gives you basic information about every company that offers direct investing. Subscribers can screen based on industry, dividend yields, fees, and many other important criteria. You can read capsule reviews of companies that offer plans. And you can use the investing strategies we've uncovered to maximize the advantages of DRIP investing. You can use this site to enter orders for DRIP enrollments. The enrollment service provided here transfers shares in the customer's name (which is a requirement to join a DRIP). In general, traditional brokers will buy shares for customers and hold them in "street name" (the broker's name). The results of making regular investments into a diversified group of companies through the company DRIP have proved to be superior over every time period for the past 25 years. With the ability to diversify and invest periodically (without fees), small individual investors can have a better chance of success than large institutional investors. Time Your Investments ...Not the Market! We Offer Guests additional information at no charge. There’s no obligation and your email will not be shared.